I’ve never understood people who think that Micro$oft Visual Basic is a good development environment. 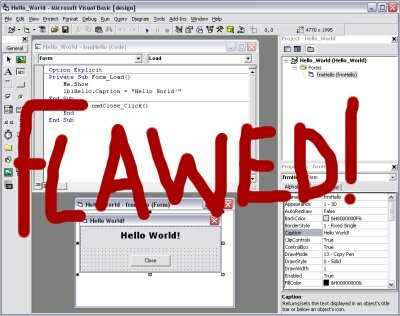 For me, VB is flawed. It is useless when one wants to write good quality code because the Basic language is too primitive (check the OO features for instance). And the GUI builder, while easy to use, only helps in producing non-compliant and, 9 times out of 10, plain ugly user interfaces. Sure, it’s nice to be able to prototype a small application in VB rapidly, but what you get is only a prototype and not commercial quality software. lol this is fun, what language do you think is worth to be learnt? Depends a lot… Choosing a programming language is very very subjective. Python powers the most popular search engines and yet schoolchildren find easier to learn than VB. VB 2005 is a complete OOP language but much more difficult to learn. I use VB for prototyping purposes and proceed with the development in VB 2005 to finally convert it into C# (with Option Explicit On). 1.How would you comment on the scenario: CSE students doing their final year project in VB? Some school children find Python easy to learn and some prefer VB. I don’t understand the first point you make. As for (1), many CSE students DO their final year project using VB. And for (2), I started with GW-Basic, moved to Pascal, loved C, tried C++, learned Java and now prefer Ruby and declarative languages (i.e. Lisp, Scheme, Haskell, …). Here also I fail to understand your point.